Historically, when we begin to enter the spring/summer months, the price of crude oil heats up. As crude starts to heat up, some chemical stocks immediately come to mind. Yes, chemical stocks, not your average oil stocks like Exxon (XOM), Chevron (CVX), Conoco (COP), BP (BP), and Sunoco (SUN), as these stocks track crude well, but don't explode like these chemical stocks have in the past when crude trades higher. The stocks that hit my radar are: Sociedad Quimica y Minera (SQM), Terra Industries (TRA), Agrium (AGU), and Potash (POT). Looking at a chart of the United States Oil Fund (USO) versus each of these companies, it looks as if SQM is the strongest one to have in case crude rises. Two major parts of SQM's business are Lithium and Fertilizer. Parts of the company's profile are taken directly from Reuters. The Company produces lithium carbonate, which is used in a variety of applications It includes batteries, frits for the ceramic and enamel industries, heat resistant glass (ceramic glass), primary aluminum, lithium bromine for air conditioner equipment, continuous casting powder for steel extrusion, pharmaceuticals, and lithium derivatives. SQM also supplies lithium hydroxide, which is used primarily as a raw material in the lubricating grease industry. The Company produces and markets granular potassium chloride, which is distributed through its subsidiary, Soquimich Comercial S.A. in Chile. In addition, it imports fertilizers that are distributed through Soquimich Comercial S.A. in Chile, offering fertilization services to its customers. Both demand for lithium and fertilizer increase when crude oil begins to rise, causing the price of stocks in the fertilizer/lithium industry to increase as well. When the price of crude goes up so does the demand for alternate energy. One major reason agriculture (fertilizer) stocks have boomed in recent years is because of ethanol. If more people want to grow corn faster they will use more fertilizers. On the other hand they are involved with lithium for batteries. When the price of oil increases so does the demand for hybrid type cars, which means the demand for batteries increases. The chart below shows COP, CVX, SUN, and XOM correlated with USO over the last 18 months. As you can see from the chart, three of the four oil names have outperformed the USO, all with greater than 25% losses (click to enlarge). The chart below shows AGU, POT, SQM, and TRA correlated with USO over the last 18 months. As you can see from the chart all of the chemical stocks have outperformed the USO, all with less than 25% losses, with SQM being the best performer and the only one which is positive over the last 18 months. As you can see all of these companies are correlated quite well with USO. Overall when the price of USO gets hot, the price of SQM gets even hotter. The reason behind this is obvious especially since the birth of ethanol. However recently from the charts you can see that they have disconnected a bit, with the greatest disconnect being when crude bottomed in February (amazingly the same time SQM was setting short term highs). SQM looks as if it has stabilized hitting its 52 week low in October, and I believe we have seen a bottom for the price of crude oil. Assuming the correlation between the two will get stronger at some point, based on last year's activity, as the price of crude oil rises SQM should also rise. SQM has a nice head start so we may see SQM hit levels similar to last year assuming crude gets back into the 60-70 per barrel range. The current Bull to Bear ratio on SQM is 10:0 compared to more bearish statistics on the other chemical companies. To see a detailed definition of this, click here. The chart above shows a clear double top set in February near $33 per share, and later in mid April at a higher high near $34 per share. The chart indicates that if we can break through resistance at $34 we could easily get to the next resistance which comes in near $37, and if we can fill in the gap down set in early September at $38, we could get above $40 a share on a short term basis. All of these chemical companies are great, but I think SQM is the strongest company, with the greatest potential, not to mention they pay a decent dividend for the longer term investor. SQM has the highest rating for EPS growth, and RSI among the group of chemical companies in this analysis. Palm has been on fire over the last 2 months, but all on speculation as there is still no news about the Palm Pre release date or price. Palm is up over 1000% since early December before the Pre was ever announced. Palm first traded higher in late December on news of an increased private equity stake in the company, and then really soared after January 8, 2009 when they introduced the Pre at the CES in Las Vegas. Palm was gaining steam trading near 52 week highs through early March, even as most other stocks traded near 52 week lows. However Palm did set its current 3 month low around the same time the major indices did, March 6, 2009. The good news is that Palm stayed above it's gap up, and has rallied ever since. I think that the release date should be around the corner. I figured that Palm would have this phone out by mid June, and they'd want to give it at least 1 month for people to know when it is being released, and pre-order it (no pun intended). Palm's last quarterly release on March 19, 2009 was ugly to say the least, they lost 86 cents a share compared to a loss of 16 cents a share in the same period last year. The consensus was for 59 cents per share, so Palm missed big but it really didn't phase the stock. Palm is putting everything into this phone and their new webOS operating system, as they have often been called their "saving graces". The chart shows that Palm has tested resistance forming a clear double bottom on the higher gap up line (gap up closing near $5.20 on January 9, 2009, and clearly bouncing off resistance of $5.20 intraday on January 15), and also coming close to retesting this low once again on March 6 [near $5.80 after getting as high as $9.60]. The chart also shows palm has broke through its long term double [possibly triple or quadruple with two slightly smaller peaks surrounding the previous 52 week high] top at around $9.50 a share and quickly spiked to about $10.75, before testing the resistance at $9.50, and quickly getting back above $10.75 closing at its fresh 52 week high May 5 at $11.50. Looking at the chart, It looks that if Palm can hold above $9.60 it could potentially go higher in the weeks to come. However It is very difficult to analyze the next resistance point for Palm, this is because Palm is trading at multi year highs. My assumption is that the phone will be released about 2-3 weeks before their 4th quarter results, which is on June 22. I am sure Palm does not want investors to think they'll know too much about sales etc... for the Pre in case it's a flop. They will be able to state some info about how well/bad the pre is selling in their Q4 conference call. I am confident Palm won't beat the Q4 estimates without any help from the Palm Pre, but they'll still be able to talk the Pre up to investors and keep the stock price up, assuming sales for the new smartphone are going well. I think Sprint will be subsidizing a nice portion of the phone, and it could run around $200-$300 with a 2 year agreement (I am waiting to renew my Sprint service for this phone). I think overall we should have some more clarity about the Pre in the week to come. I think if Palm waits longer than 2 weeks (past May 20) to give details of phone price, and phone release date, there will be significant selling pressure on Palm's stock. The short interest on this stock is extremely high! The current short interest is 39.48%, which is down from over 50% short interest 2 months ago. If Palm hits a home run with this Pre smartphone, this stock could rocket to $15 and even $20, just by having shorts cover! The only bad thing about the Pre is that it is exclusively for Sprint for the time being and this will most likely hurt them, because I cannot see too many people changing carriers for this phone. Although I must say the new Sprint commercials are very creative, and I think they are creating the "buzz" they need for the Palm Pre. Let's face it the entire universe is excited about the Palm Pre, if they do it right palm will certainly be a top competitor in the future with the Pre and Pre like devices to come! What is the Next Company to be Delisted from the Dow, and which Company will Replace it? I think the Dow Jones Industrial Average (DJIA) is due for some new blood by year end 2009, as there are just too many of the 30 Dow components performing poorly. If one of these companies goes bankrupt they’ll certainly be delisted from the DJIA. Recent talks and data from the credit default swap market have assigned the highest probabilities of bankruptcy to: Bank of America, Citigroup, General Electric, and General Motors. Of course there are other companies with even greater risk of bankruptcy, but these are the companies with the highest risk of default among the Dow components. Whether one of these companies actually goes bankrupt or not, I still think the Dow is due for a reshuffle, and I want your guess on what you think for a chance to win some $! There are two ways to win some money from this contest: the first is the easier of the two and will pay $20 to the winner, and the second is a bit harder and will pay $30 to the winner. First part of contest: I want to hear which stock you think is next to be delisted from the Dow. Second part of contest: In the case a stock gets removed, I want to know which company will replace it. Feel free to participate in both parts of the contest! State your guess by commenting on this post, which of the 30 Dow components is next to get delisted from the index. You can view all of the 30 Dow components, 52 week highs/ lows, and most recent close price (last price during market hours) in a simple Excel spreadsheet. To download this spreadsheet click here (works best with FireFox). If you don’t think a company will be removed by December 31, 2009, state that and in case of a tie breaker also state what you think the DJIA will close at on December 31, 2009. In case of a tie breaker state the price at which the stock being taken from the index will close on the day before it is no longer in the index (Example: if a stock is taken from the index on September 18, 2009 state close price as of September 17, 2009). In case multiple companies get delisted simultaneously, the winners will split the prize money equally. In the case two or more individuals guess the first company delisted and the same price, the winners will split the prize money equally. You must be a resident of the U.S.A and must be 18 years or older. Money will be sent via Paypal so you must have a Paypal account. You must comment on this blog post with the name of the company only; however you must also email me at optionsmaniac@gmail.com with company name, closing price information (in the case of a tie breaker), and your Paypal email address. I will use your email address for identification purpose only and I will not send any unsolicited emails. The sooner you enter this contest the better. The ultimate deadline to enter this contest is July 3, 2009; however if a Dow component files bankruptcy, the DJIA is officially adjusted (or announced to be adjusted) before July 3, 2009, the contest will be declared over. State your guess by commenting on this post, which company will replace the company which will be removed first. In the case you don’t think a company will be removed by December 31, 2009 you don’t have to participate in this contest, but why not take a guess for $30? In case of a tie breaker state the price at which the stock being added to the index will close on the day before it is listed in the index (Example: if a stock is taken from the index on September 18, 2009 state close price as of September 17, 2009). In case multiple companies get listed simultaneously, the winners will split the prize money equally. In the case two or more individuals guess the first company added and the same price, the winners will split the prize money equally. Good luck! Please invite your friends and social bookmark this contest! Sell in May? No Way! Therefore the months of May used for this analysis were: May 1954, May 1958, May 1961, May 1971, May 1975, May 1983, May 1991, and May 2002. 5 of the 8 months of May following the end of a recession (or 4 out of 7 if you exclude May 1954) finished the month with a gain. The average gains for the months of May following a recession are 500% greater than those not following a recession, and over 325% greater than the overall average for May dating back to 1950. To download the spreadsheet used in this analysis click here. So if May is higher what will the following month of June bring? The data from my analysis shows that June is higher by an average of 0.05%, while a June not following a recession is higher by 0.17%, and a June following a recession is lower by 0.77%. So far over the 2 days the market has been open this May, the S&P 500 is 2 for 2 and has done extremely well, up 3.9% with financials leading the way. Bank of America (BAC), Wells Fargo (WFC), American Express (AXP), Goldman Sachs (GS), JP Morgan (JPM), Bank of NY Mellon (BK), and even Citigroup (C) have all been up BIG, even with the stress test results to come out in less than 3 days. At this pace we are on track to break the record for May- May of 1990 up 9.2%! If the S&P 500 finishes May higher than the average, could this indicate the gloomy days are behind us? Please share your thoughts. Cover me, come on baby, cover me"
The Boss may have said it best in 1984 when he wrote the song Cover Me. Of course this song was not about writing covered calls to provide some protection on the downside, but we can certainly interpret it that way in today's market. If you are unfamiliar with covered calls check out my E-Book, guaranteed to teach you how to write a covered call, and will make more than your money back by writing your first covered call option. Covered calls are a great way to create income and wealth off your current portfolio, all you need is at least 100 shares of any stock that has options available on it. If you have 100 shares or more of any of the current stocks below you are in great shape to start! And of course you have "options", so you may want to chose a different time period or strike price on any given security. Below is a look at some of the best rated covered call option strategies for June. The list is the current "S&P Best 10", all of which are covered call option strategies. Note that the net debit is the price the underlying stock must be at in order to break even from writing the covered call. I am a writer of covered calls, and being an active writer has certainly helped me significantly outperform the market over the past 5 years. Many people write covered calls in or very close to the money, but I do not like to write covered calls too close to the money. 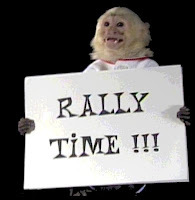 My strategy for writing covered calls on stocks I am bullish on, is to write them out with about 14-17 days left until expiration, and have a 75% chance or greater of expiring dead. This way I can keep the stocks in my portfolio, and receive the premiums month after month creating a nice income. Occasionally I write in the money covered calls on stocks which have experienced significant runs, and this has helped me hedge myself against the downside risk. Life Takes Visa... Just How Powerful Are They? Recently Visa reported an absolute blowout quarter. In just their first year public amidst an economic disaster, they have been a powerhouse. Visa was expected to make 64 cents a share and they reported better by 9 cents or 73 cents a share. Quarter over quarter growth: for revenue was 13.35%, EPS was 40.38%, and net income was over 70%. Looking at the chart it looks like if we can get Visa above 68 a share it could easily get to the 71 range. Visa closed the gap down set in late October which if it can hold above the 63 level is a very bullish sign. If Visa breaks below the gap down set in late October, this is a bearish sign, and we could easily test resistance at the 60, and then the 58-56 level. The chart is indicating Visa wants to trade higher in the weeks to come. With the growth of credit cards not only in the United States but globally, I think Visa's EPS growth at 18% for the FY 2010 year is extremely low. Visa should be able to grow at an even greater rate coming out of this recession. Given the growth of credit cards in the past decade especially due to e-commerce, I believe in the next decade to come, credit/debit cards will be the number 1 form of payment. The three biggest players are Visa, MasterCard, and American Express with Visa being to credit cards what Xerox was for copiers. So just how powerful is Visa? 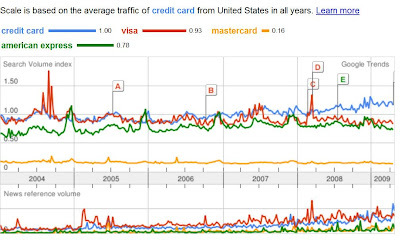 Using Google Trends we can see what the search results for the keywords: Visa, American Express, and MasterCard, against the term Credit Card are. The results may be startling (click image to enlarge). As you can see for every 100 searches for the word credit card, Visa was searched 186 times, followed by American Express 74 times, and MasterCard with 28 times. 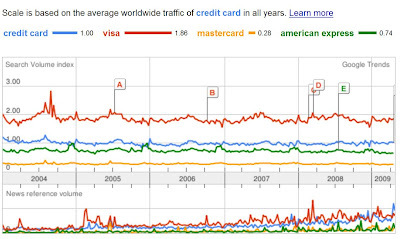 The word "Visa" was actually Googled more times than "credit card". The words "credit cards" and "master card" were also checked but both were even weaker than the terms used in this analysis. Also from this analysis we can see that "Visa" was searched heavily about a month before its IPO which was March of 2008. We can also see during the first and second quarters of 2008 Visa was searched at an increasing rate. Why could this be? Maybe it was because consumers were getting squeezed by higher gas prices and were in need of more credit, perhaps it was Visa's extremely creative ad campaigns which emphasized cashback on gasoline as well as other purchases, as the fears of recession started to hit consumers, or perhaps it is just the Visa trend. Each year shows a similar trend for the term Visa. This data indicates Visa is Googled most in June or July of each year, and decreases steadily until late in the year, it has a drastic increase (this late-year increase is also similar for American Express). Could this be consumers seeking additional credit, because they spent too much during the holidays? This may be the case, but this data shows instead of searching for "credit card" in general they search Visa. This data shows Visa to be quite popular and preferred among consumers worldwide (all regions). The Google trends image below shows the results for just the terms Googled in the U.S. The word credit card is Googled more than Visa, but just 7 times out of 100, but American Express and MasterCard are still lagging. Google trends also shows Visa to be the preferred card in the fastest growing developing countries. Searching the same keywords (excluding credit card) for the BRIC countries are as follows. Data from Brazil shows the terms MasterCard and American Express to be Googled 36 and 22 times respectively for every 100 times Visa is Googled. Russia shows Visa to be Googled 50 times more than MasterCard with the term American Express not even hitting the radar. India shows the terms MasterCard and American Express to be Googled 1 and 10 times respectively for for every 100 times Visa is Googled. And China the biggest and fastest growing country shows the terms MasterCard and American Express to be Googled 2 and 7 times respectively for every 100 times Visa is Googled. These results certainly show the whole world takes and prefers Visa. In conclusion I am extremely bullish on Visa both short and long term.